Urethane replacements at rubber prices! HEAVY DUTY Urethane pieces are 1" X 10" X 12"
Urethane wings have a five times higher abrasion resistance than rubber wings. Using urethane wings made from a special formulated compound will reduce labor cost and downtime. Our new compound gives you urethane quality wings at rubber / neoprene pricing. Availability: Standard sizes in stock. Shipping: Typically 1 week. Call for rush shipping. Anything 108" and above requires special freight charge. The above price does not include shipping. Wings can be custom made to your specification. NO LIMITATIONS - Deal directly with the manufacturer. Urethane quality plow wing at rubber pricing! 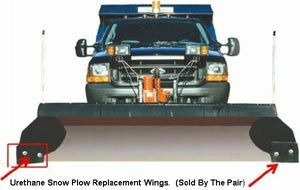 Reduce truck downtime because you don't have to change the plow wings as often - Cut maintenance costs.